Winchester Cathedral is one of the finest medieval Cathedrals in Europe. 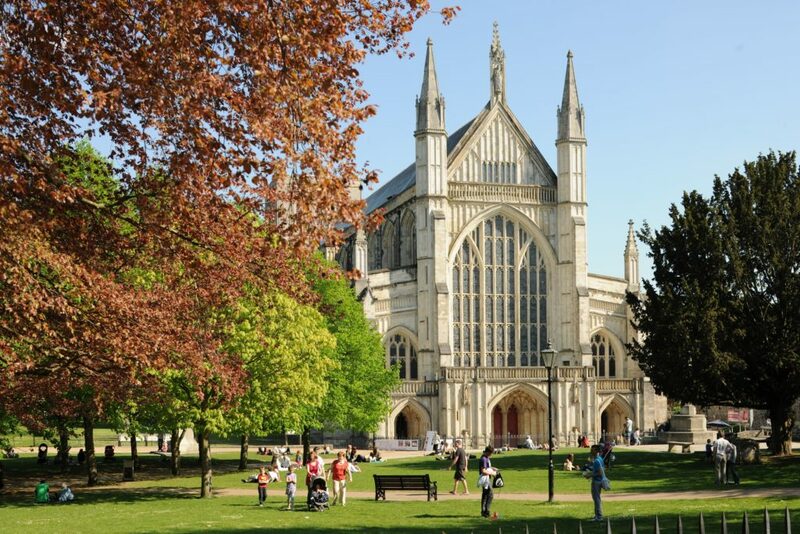 Located at the heart of historic Winchester, the Cathedral grounds are a haven of peace and tranquillity where you will find picturesque buildings, fabulous views and a wealth of history and heritage. The Outer Close is a much-loved public space which connects the city with the Cathedral. It boasts a spectacular lime tree walk leading towards the Cathedral and is the perfect place to relax in the summer. To the left of the Cathedral you will find the excavated site of the Anglo-Saxon Old Minster. The Outer Close also provides access to the Cathedral Refectory where you can enjoy a delicious slice of homemade cake and locally sourced food whilst admiring its pretty walled garden and terrace with Cathedral views. To the right of the Cathedral you will find the atmospheric 17th-century Curle’s Passage which leads to the historic Inner Close, the former site of the main cloister of St Swithun’s Priory where the monks once lived. Many of the former monastic buildings have long-since disappeared but there is still much to explore including Dean Garnier’s Garden. This tranquil walled garden stands on the site of the monks’ dormitory, a place of stillness and beauty resting quietly in the shadow of Winchester Cathedral. Other highlights include the Chapter house arcade, Cheyney Court, the Deanery, and the Priory Gate, which leads to the lush water meadows that lie beyond. These medieval buildings lend a special charm and timeless atmosphere to the Inner Close. This year, garden lovers can also enjoy a spectacular flower festival at Winchester Cathedral. The Cathedral will be transformed by Illumination: A Festival of Flowers from 5–9 September. Immerse yourself in a spectacular array of colourful and fragrant floral displays inspired by the magnificent 12th-century Winchester Bible, with tickets from £7.